There are only a few cakes I've made since January that I would make again. And again. 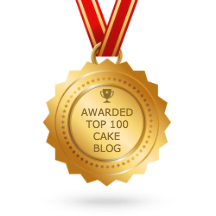 This very special poppy seed cake (isn't it gorgeous?) may be first on the list. 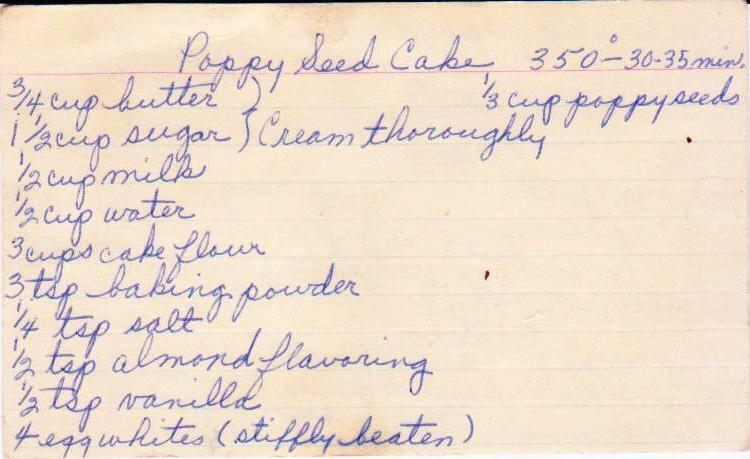 Simply called Poppy Seed Cake, it from the collection of Mrs. Lloyd (Ruth) Duenwald, and is among the South Dakota childhood taste memories of her daughter Mary, a dear friend of mine. About two weeks ago Mary brought over not one, but THREE poppy seed cake recipes (and two Red Devil's Food cake recipes) from her late mother's extensive recipe collection. 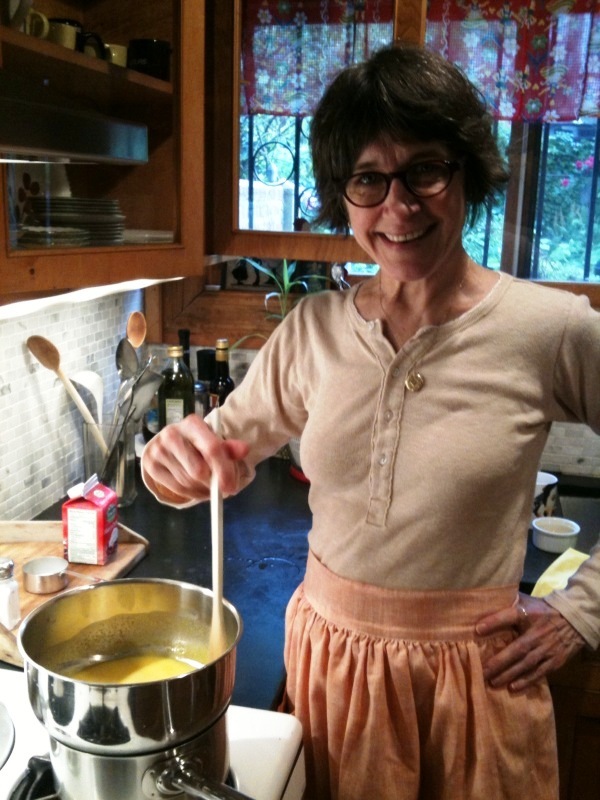 Mrs. Duenwald was a woman who clearly knew her way around a kitchen. This is a delicious cake that packs an unexpected surprise (though aren't all surprises unexpected?) What makes the cake so special is the explosion of tastes and textures via its three distinct elements -- the cake itself, the surprise filling (a vanilla custard with walnuts, pictured below) and an unusual white frosting. By the time Mary arrived for our afternoon of baking, the poppy seeds had been soaking for a couple of hours. It's always important to read through the entire recipe before beginning, so you don't get surprised halfway through by an instruction that says something like "refrigerate for twelve hours" when you're planning to serve it for dinner that night. This cake takes time, so I'd recommend doing it with a friend (and a bottle of wine wouldn't hurt either!) who is happy to stir the filling (see Mary below) while you beat the egg whites. Baking must be in Mary's DNA. 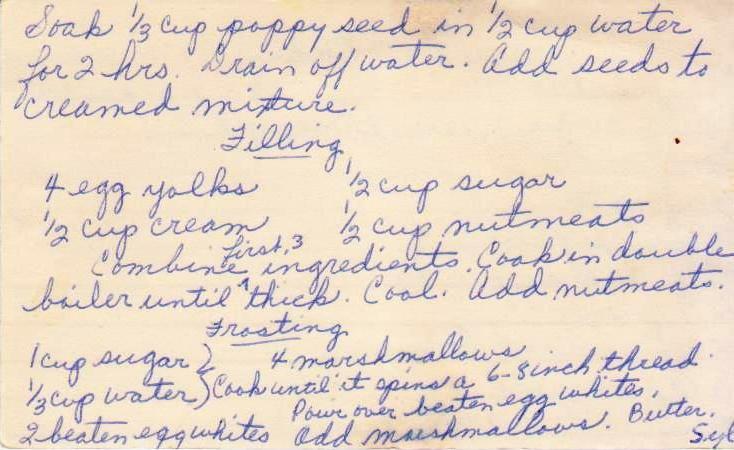 In addition to being the daughter of a great baker, her grandmother baked a cake every day! 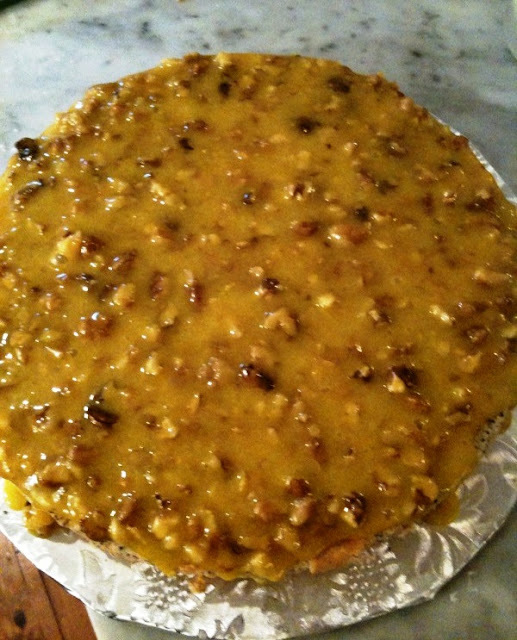 When we at last sat down to taste the cake, I was thrilled when she said it was just as she remembered it. For those readers who want to make this cake (and I hope many of you do), I've written up a few notes that follow the recipe, pasted below. 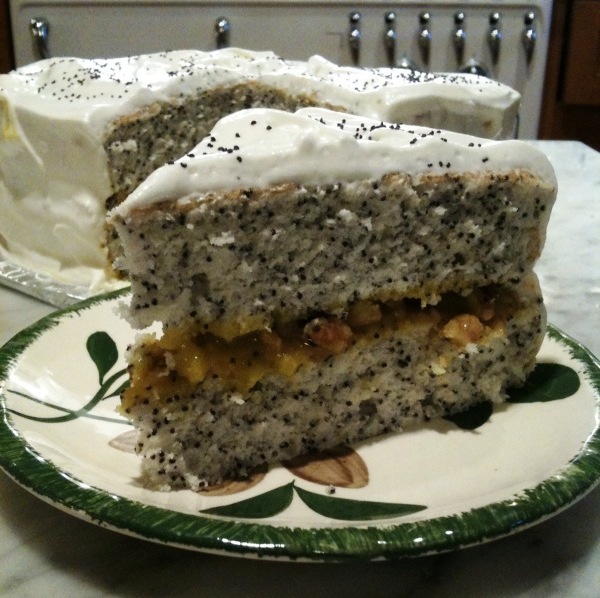 Cake: Soak 1/2 c. poppy seeds in one cup milk, refrigerated for several hours. (This is a different amount than in the recipe. Ignore the 1/2 cup of water.) Cream the butter (make sure it's at room temperature) and sugar. Mix the flour with the baking powder and salt. Alternately add the flour mixture and the milk/poppy seed mixture to the butter/sugar mixture, beating well to incorporate the ingredients. Add the almond and vanilla. In a separate bowl, beat the egg whites until stiff but not dry (you can add a bit of cream of tartar to help insure that they won't be overbeaten). Filling: Follow recipe exactly (but you might consider adding the juice and zest of a lemon for another flavor note). Frosting: Beat the egg whites first, and have them nearby in a bowl. Cook the sugar/water until thread stage (230degrees). Ignore the words "4 marshmallows" -- unless you can figure out what to do with them (we couldn't!). At the very end, add as much butter as you want. 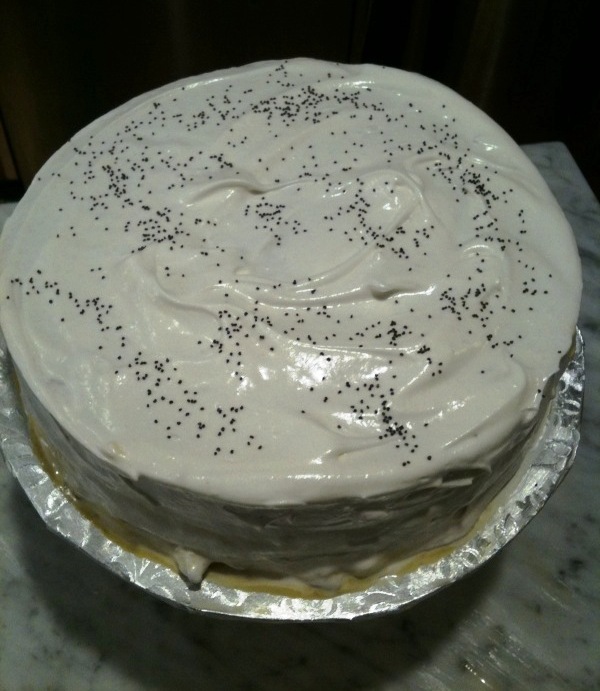 DH suggested sprinkling some poppy seeds atop the cake to give people a preview, which does give it a nice touch. I've been looking for a good recipe with poppy seeds and I'm going to try this one next. Thanks for sharing! Allison: It is delicious and please let me know how it turns out.